In this richly detailed novel about the quest for an unknown father, Julia Glass brings new characters together with familiar figures from her first two novels, immersing readers in a panorama that stretches from suburban New Jersey to rural Vermont and ultimately to the tip of Cape Cod. Kit Noonan is an unemployed art historian with twins to help support and a mortgage to pay—and a wife frustrated by his inertia. Raised by a strong-willed, secretive single mother, Kit has never known the identity of his father—a mystery that his wife insists he must solve to move forward with his life. Out of desperation, Kit goes to the mountain retreat of his mother’s former husband, Jasper, a take-no-prisoners outdoorsman. There, in the midst of a fierce blizzard, Kit and Jasper confront memories of the bittersweet decade when their families were joined. Reluctantly breaking a long-ago promise, Jasper connects Kit with Lucinda and Zeke Burns, who know the answer he’s looking for. Readers of Glass’s first novel, Three Junes, will recognize Lucinda as the mother of Malachy, the music critic who died of AIDS. In fact, to fully understand the secrets surrounding his paternity, Kit will travel farther still, meeting Fenno McLeod, now in his late fifties, and Fenno’s longtime companion, the gregarious Walter Kinderman. 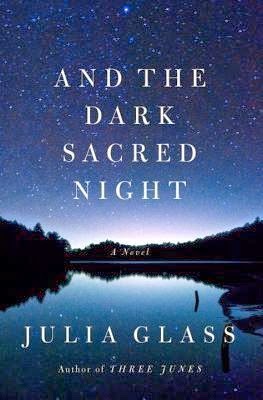 And the Dark Sacred Night by Julia Glass is a recommended novel for those who enjoy melodramatic family sagas, especially those that span several novels. In And the Dark Sacred Night Kit Noonan is ordered by his wife, Sandra, to find out the identity of his birth father. Kit's mother, Daphne, has withheld the information from him for the 40 plus years since his birth. Currently Kit and Sandra are the parents of twins. Kit is an unemployed art history professor who is experiencing inertia, or more likely depression, since he lost his job. His marriage seems to be in trouble but his wife insists that discovering who his father is will be the key to pull him out of his funk. Kit takes off to see Jasper, his stepfather and former husband to Daphne, at his home. Jasper was a father to Kit along with his own two boys and Kit turns to him to find the answers that Daphne refuses to share. Since Jasper promised Daphne he would keep her secret, he doesn't divulge everything he knows, but does give Kit a name to contact, which helps him continue his search for the truth. The writing is quite good in And the Dark Sacred Night, but the plot left something to be desired for me. Perhaps it would have helped if I had read the first novel, Three Junes, which has characters that tie the two stories together - or perhaps not since this novel is said to be a stand alone novel. What I did feel was an overwhelming sensation that I was missing part of the story, some essential kernel of truth that would pull it all together into a fabulous sprawling tale of family ties, destiny, and forgiveness. Instead of that I was left with questions right at the start when a wife inexplicably sends her forty-something unemployed husband off to seek the identity of his true father because that will give him the answers he needs... even though they are apparently having marriage problems. It just didn't ring true to me. Additionally I could not understand why Daphne wouldn't just tell this adult man who his father was. There was no point in hiding the information from Kit. Kit himself was a bore. I understand he has shouldered the great burden of this mystery for his whole life but at 40+ years old one would think he would have come to terms with it and be creating a life for himself. That said, the novel redeemed itself for me in other ways. I felt there was some great character development in many of the other characters and really liked them. The problem was, for me, Kit was the least intriguing character but the main character.